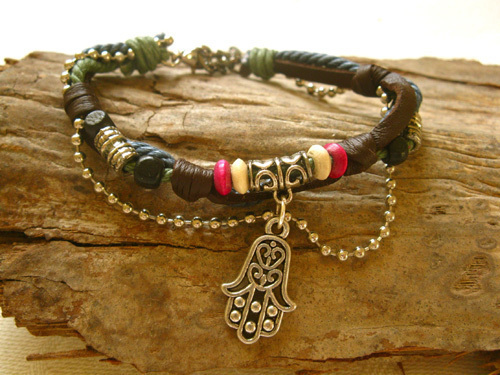 This lovely, earthy leather, cord and chain bracelet ~ pomegranate is one of our NaturalSoul range and features a row of wood and metal beads and a little Hamsa symbol. The Hamsa (or Hand of Fatima) is a palm-shaped amulet used in many societies and religions as a sign of protection providing defense against the 'evil eye' and to help strengthen the vulnerable or weak. It represents blessings, power and strength and is therefore a popular good luck charm. Dimensions: Length of bracelet approx 19cms (7.5"), but has 5cm extender chain. Fastens with lobster clasp. 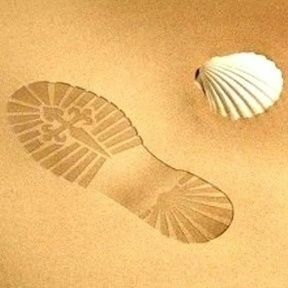 Do you know someone who could do with some extra belief for a special event, or protection as they embark on new ventures? Show them that you care and that you are thinking of them with this lovely bracelet of inspiration. Comes gift-wrapped, like all our presents (with an information card) - and we can print a personal message on your behalf. The "evil eye" has nothing to do with "evil". Instead, it means a look of envy - believed to be derived from an old Celtic word for desire and jealousy, and not a curse or malediction.